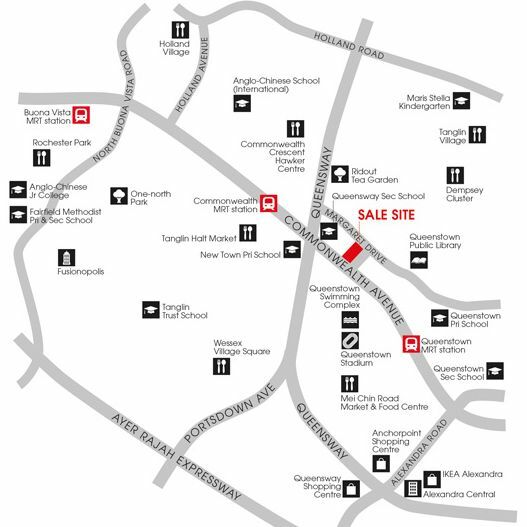 As announced last Thursday (03 Nov 2016, by the Urban Redevelopment Authority (URA), a 0.48-ha private residential site situated at Margaret Drive has received a triggering bid of no less than $185.76 million (SGD) and it will be put up for sale, via public tender. The site with a 99-year tenure will be available for sale under the 2H2016 Government Land Sales (or GLS) programme’s reserve list. Such sites will only be released for sale upon receiving adequate interest or a minimum bid determined by the government from a property developer. Located within touching distance of Commonwealth and Queenstown MRT Station and being well-connected via the Ayer Rajah Expressway, the new residential site is expected to yield approximately 275 private homes. Despite having major launches within the same district with plenty of balance units available, such as Commonwealth Towers, Alex Residences, Principal Garden and Mon Jervois (which just attained T.O.P), property analysts have commented that the land parcel will be expected to draw strong interest from property developers due to its strategic location and manageable land size – with estimated 7 to 12 bids expected. The latest new launch condo released within the vicinity is Queens Peak (averaging at $1,632 psf on first day of sales) which its land was acquired for $871 psf ppr in June 2015. It will serve as a price reference for potential developers who are interested in the Margaret Drive site. The top bid for this land tender at Margaret Drive is expected to range between $205 million to about $218 million, which will translate to approximately $858 to $912 psf ppr.